It’s December! How did this happen? I didn’t even notice November passing by, and now all of sudden I’m in the middle of the holiday rush. I told myself that this year I’d be prepared, get things done in advance. I even set up a series of reminders in my calendar, but I ignored them because I thought I had lots of time. Sigh. This recipe is great for those of us who are pressed for time. It comes together in less than 30 minutes, and a lot of the ingredients are pantry staples. If you’ve got shrimp in the freezer you could probably make it right now. The recipe is based one from Ina Garten’s How Easy Is That? Heat half of the oil in a large oven proof pan over medium heat. Sautée the onion till softened. Add the garlic and cook for 1-2 minutes. Add the wine and cook till reduced by half, scraping off any browned bits from the bottom of the pan. Add the tomato puree, oregano, and fennel seeds, as well as salt and pepper. Bring to a boil then simmer for 10 minutes. While the tomato is simmering, mix the bread crumbs, parsley and remaining 2 tbsp of oil together. Season with salt and pepper. 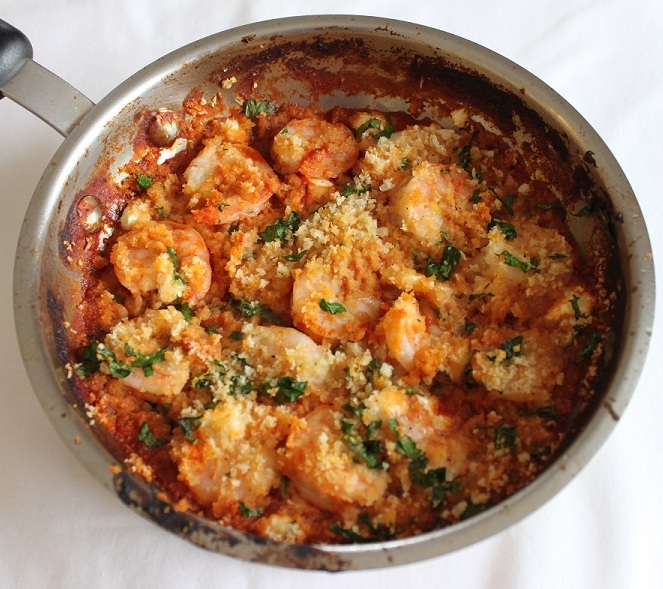 After 10 minutes, place the shrimp in a single layer over the sauce, then sprinkle with bread crumbs and goat cheese. Bake for 10 to 15 minutes until the shrimp are cooked through. What a great dish! It looks and sounds wonderful! I hope you get the book too! So far everything I’ve made has turned out great. The recipes are all really simple yet delicious. your roasted shrimp looks incredibly flavorful….wow…..now I’m hungry all over again! i think this dish looks very tempting:) thanks for sharing this. Yes! We’ve got shrimps in the freezer! I’ll show this post to my boyfriend, he’s the main shrimp eater in our family ;-) I’m not crazy about shrimps, but I think I would try the dish you suggested, with goat cheese and tomatoes… mmm! What a lovely and simple dish! I came across this yesterday and was able to get shrimp on sale (yay!) at Whole Foods, so I made this for dinner last night. It was fantastic – and so quick/easy. Perfect for a weeknight dinner. I served it with a green salad and a bit of baguette to scoop up all that melty goat cheese – yum. BTW it was great meeting you at EWR! Hee, tagged “vegetarian.” Shrimp aren’t vegetables! Great recipe though, thanks!